To recline or not recline – that is the question. There were two incidents last week over reclining seats on an airplane (News Flash: A 3rd incident). Ironically, all of the incidents took place on flights with extra leg room! The pilots diverted the flights and had passengers escorted off the plane. Reclining is a hot topic and people have strong feelings about it. One person from Sports Illustrated said that reclining is the “peak of selfishness“. Others loudly insist that there is absolutely no reason that people should recline. These people are dead wrong in their assessments. There is a whole group of people who must recline on an airplane because of the physics involved with flying. I’m providing a math-free lesson to show you why. Here’s a little secret that most people don’t know – airplanes have to fly with their nose tilted up. The upward tilt isn’t much, but it is noticeable. The plane has to fly upward at the same rate it is falling down due to gravity. The tilted nose means that all the seats inside the aircraft are tilted at the same angle. I have illustrated the positions of the seat in relation to the ground in the picture below. When the airplane is on the ground, the weight of your body goes through the spine and into the seat – just the way it is supposed to. The upward tip of an airborne plane means that the weight of the body is transferred to the lower back. This can cause extreme pain to those with lower back problems. What is really important is what happens to the passenger’s back during the flight. When the plane is on the ground the weight of the body goes through the spine and into the seat. Everything is supported the way nature intended. Happy, happy. During flight, the seat tips slightly. This means that the weight is off the entire spine and concentrated into a small area of the lower back. Anyone with a lower back injury or sciatica problems will have the entire weight of their body focused into their injuries. Their back will be in spasms by the time they get off the plane. How does the injured passenger take the weight off of their lower back? By reclining. If you look at the picture below you’ll see that reclining the seat by just a few inches transfers the weight of the body from the lower back to the mid-back. That is usually enough to mitigate the passenger’s injury. You’ve probably heard some people say “I have a back injury and I never recline!” I’m willing to bet that these people have upper back problems. As you can see from the illustration, reclining would actually make upper back and neck problems worse. An upright airplane seat Vs. a reclined airplane seat. The plane is always tipped upward when it is flying. 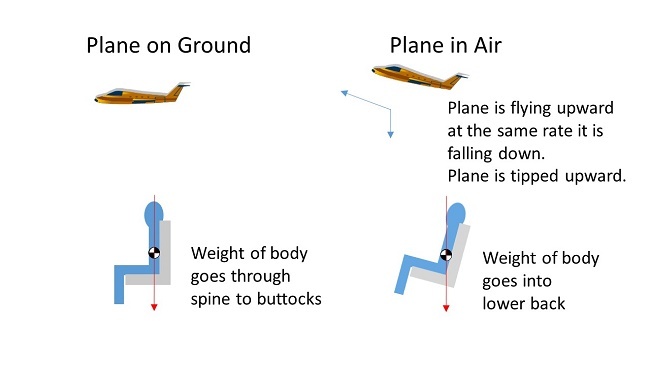 This means that the weight of the body goes through the lower back when the airplane seat is in the “upright” position, as shown in the illustration to the left. 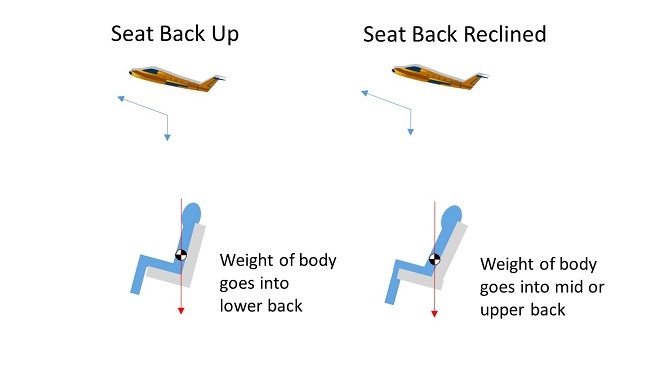 Reclining the seat by just a few degrees (a few inches) transfers the weight of the body to the mid back, as shown in the illustration to the right. May I accommodate my disability? Please? So is it rude to recline? I would ask a second question. Is it rude to accommodate a disability? Better, is it rude to accommodate a disability using something that is allowed on the airplane? The pain from lower back problems is intense and searing, going from the base of the neck to the tip of the toes. Reclining is just one part of mitigating the problem. I hope you anti-recliners will understand. I am trying to get a pain free flight just like you. Pay attention to the person sitting behind you. If they are tall, offer to switch seats so you won’t have to recline on them. Most people with lower back problems have already worked with a physical therapist. Make sure you do your stretches before, during, and after the flight. Always take your anti-inflammatory/pain medicine with you. Take it just after you board so it is taking effect by the time you are in the air. Keep the pain medication in your travel comfort kit so it is available. Many pain medications cause stomach/digestive problems. Always carry a snack and a collapsible bottle filled with water with you to help ease the side-effects. Recline slowly to avoid problems with the person behind you. Play nice – don’t recline your seat during meal service. Play nice – recline the seat the minimum amount needed to take the pressure from your lower back. Try cycling your seat every few hours between the reclining and upright position. This will give respite to the person behind you and the movement will help keep your back from going into spasms. Bring a lumbar support. This will push your lower body forward and move the pressure point on the back. Don’t do this if you have neck issues too – that will make things worse. Try to reserve a seat on the aisle so you can extend your bad leg. Please be careful not to trip anyone and keep your legs under your seat during takeoff and landing. Consider flying multiple short legs of a trip instead of a non-stop flight. Use the connection time to stretch your back and legs. Some planes have the newer seats that slide forward when they recline. Try to fly on these planes as much as possible. Seat Guru has the seat pitch (distance between seats) for each airline. Patronize airlines that have a larger seat pitch. There’s more suggestions over at Spine Health. Please don’t engage in passive-aggressive tactics. If you are having problems, talk to the person in front of you. That’s what real adults do. Please accept that the person in front of you may have a medical condition and they may need to recline. They are not intentionally trying to harm you, so treat them politely. Not all disabilities are visible. You can’t see the 4″ scar from my spine surgery. Offer to swap seats with someone who has to recline. Squished is the new normal. I’m going to be blunt – it is delusional to think that you can work on a full-sized laptop while in economy class. If you must work on your computer then set it on your lap, or buy a small tablet. By the airline definition, you are now a Person of Size. Consider accommodating your size by buying a premium economy seat. No, it’s not fair, but it is pragmatic. Some airlines have seats that do not recline. Consider flying on them if reclining is causing you problems. Remember that this isn’t about winning or losing. It’s about both of you getting your needs met. A little negotiation goes a long way. Thank you so much for educating us all. I do not recline my seat, since I don’t need to, but someday I might just need to and I think I’ll have your wonderful explanation printed out to hand to the person in back of me. Honestly, I think flying is so unpleasant these days (at least in economy) that everyone starts out cranky before the plane ever leaves the ground. At any rate – thanks again. I learned a lot today. Thank you for the information! I travel for work (in the air 3-4 days a week), and I don’t know that I’ve ever had a problem with people in front of me reclining. If I don’t have the space to work, the complaint is with the airline, not my fellow passengers! I will pass this information along to those that complain, however. I agree some people need to recline, and yes if you’re overly aggressive that’s bad. But I have no sympathy for the ones that recline, injuring the person behind them, or not having the decency to fix the seat when the person asks nicely. Injury of the person behind you is not okay no matter what. No injury occurred for any of the 3 recline rage incidents, yet the person behind the recliner was aggressive. The 3rd person did claim injury, but only after the fact. I have a hard time believing there was injury because she lied about other things, such as not threatening the flight attendants. Let’s face it, you have t slam the seat back hard to cause injury to another person. Possible? Yes. But you have to work at it and it isn’t how most people recline. And really, a reasonable person is going to expect the seat to come back at any time, just like a car could appear while you are in the street. Yet people act surprised when the person in front of them reclines. I’m not sure what you mean by “not having the decency to fix the seat when the person asks nicely” means. Should I sit upright just because the person behind me asks nicely? That’s unreasonable because it doesn’t fix the problem. I will work with the person to try to find a joint solution though. A “non-apparent” disability greatly impacts my life, and I’m sorry for your back pain. True, some folks really value that ability to move their seat. It’s unfortunate that more attention isn’t paid to the space constraints placed upon travelers by the airlines. Sometimes, a small dialogue goes a long way, along with an apology; I’ve been asked if there’s a reason I am in the disabled seat on public transport, etc. and most folks accept my brief explanation that I am legally disabled (with Rheumatoid Arthritis). Just a semblance of civility is sometimes all we need to remember that we are each obligated to share space on planes and similar public forums. I specifically seek out airlines with reclining seats and with bigger seat pitch so I can recline. I can and have paid a higher price for those seats to make sure my needs are met. Thank you for such a thoughtful and enjoyable blog! Have been a reader since 2012.